Other MRI sequences and imaging modalities (including positron emission tomography (PET) and dopamine transporter (DAT) scans) have diagnostic value in particular clinical settings. A 58 year old right handed woman was referred with a three year history of word finding difficulty and poor memory. Problems with reading, calculation, and spelling had emerged more recently. She could find her way around and was still driving. She was more irritable and less outgoing. Her symptoms were slowly progressive with a suggestion of day to day variability. There was no significant past medical history and she took no medications. There was a family history of cardiovascular disease but not of dementia. She did not drink alcohol to excess but had a 25 pack year smoking history. The physical examination was unremarkable. The mini mental state examination score was 25/30: she could recall all three items after a delay, but lost points on orientation, naming, calculation, and for following a three stage command. Initial investigations, including full blood count, electrolytes, liver function, thyroid function, erythrocyte sedimentation rate, vitamin B12, folate, and a chest x ray, were normal. As with many patients presenting with early cognitive problems, the differential diagnosis is wide. Anxiety and depression are associated with cognitive symptoms and they also complicate established dementia. Space occupying lesions including tumours, though unlikely, require consideration. Dementia—acquired, progressive cognitive impairment sufficient to impair activities of daily living—is more typically encountered in older people, but is not uncommon at younger ages.1 In an ex-smoker with a family history of cardiovascular disease, vascular cognitive impairment, which can be associated with focal cognitive symptoms, depression, and insidious rather than stepwise cognitive decline, should be considered. Alzheimer’s disease is the most common neurodegenerative cause of dementia. The history of memory and executive decline in the context of fluctuations makes dementia with Lewy bodies possible, even without parkinsonism or visual hallucinations. Naming and behavioural problems are commonly seen within the frontotemporal lobar degeneration spectrum, which includes behavioural variant frontotemporal dementia (previously Pick’s disease), progressive non-fluent aphasia, and semantic dementia (fluent speech with loss of word meaning). Critically, distinguishing these causes from one another has implications for management, as acknowledged in UK national dementia guidelines.2 Surgery for an intracranial mass lesion is potentially curative, as is pharmacotherapy for depression. Even in the absence of disease modifying therapies, other dementia disorders still require specific treatment strategies, such as modification of vascular risk factors in vascular cognitive impairment, and acetylcholinesterase inhibition for Alzheimer’s disease and dementia with Lewy bodies, for example. Accurate diagnosis facilitates prognosis and counselling, referral to appropriate services and voluntary organisations, applications for relevant benefits, and important lifestyle, occupational, and legal decisions, including those related to driving. How can brain imaging help? Where magnetic resonance imaging (MRI) is not available or contraindicated, computed tomography (which does involve exposure to ionising radiation) can usefully exclude major space occupying lesions, hydrocephalus, and large infarcts. Modern multidetector computed tomography scanners make it possible to acquire volumetric imaging data of the whole brain in a few seconds, which allows high resolution multiplanar reconstructions to be performed. Images reconstructed in the coronal plane allow detailed assessment of the medial temporal lobe structures(fig 1⇓). 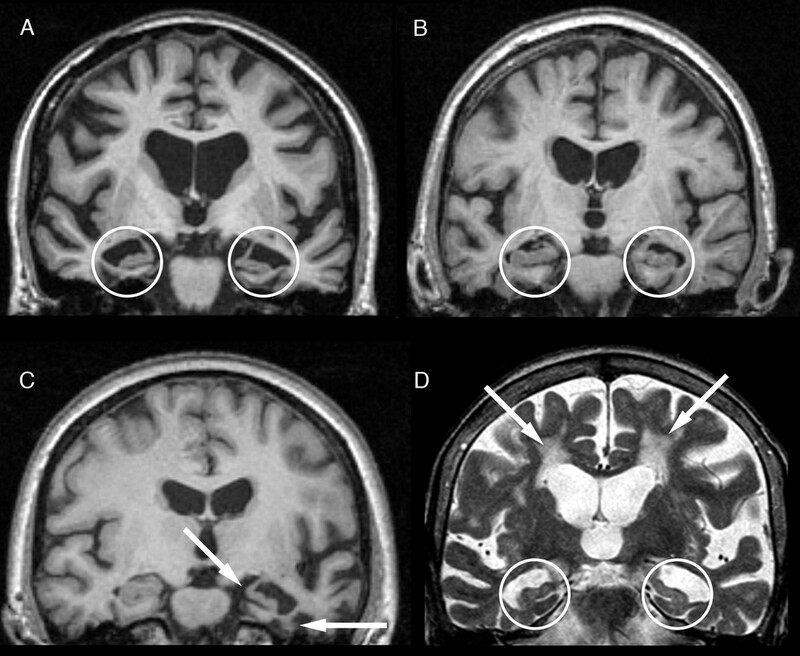 MRI, with its superior contrast resolution, is increasingly preferred over computed tomography in the evaluation of suspected dementia.2 A basic dementia sequence including a high resolution structural volumetric T1 weighted scan and T2 weighted or fluid attenuated inversion recovery (FLAIR) sequences can be obtained in approximately 20 minutes. MRI does not involve ionising radiation, but claustrophobia may be a limiting factor in some patients. MRI is contraindicated in patients with pacemakers and certain metallic implants, and earplugs should be worn to prevent the possibility of cochlear damage. T1 weighted volumetric MRI scanning provides a very detailed assessment of brain structure, allowing for the assessment of the presence or absence and pattern of brain volume loss, ie, atrophy. When evaluating a patient with cognitive impairment it is particularly valuable to assess for medial temporal lobe atrophy on coronal reformats, either qualitatively or using simple rating scales. The presence of bilateral, symmetrical hippocampal atrophy distinguishes mild Alzheimer’s disease from controls with approximately 80-85% sensitivity and specificity (fig 2A⇓).4 6 Alzheimer’s disease is also associated with relatively greater and more disproportionate hippocampal atrophy than dementia with Lewy bodies (fig 2B).7 In contrast, asymmetric temporal lobe atrophy with an anterior>posterior gradient is at least 85% specific for frontotemporal lobar degeneration,8 and focal left inferior/anterior temporal lobe atrophy is highly suggestive of semantic dementia (fig 2C).9 The presence of medial temporal lobe atrophy in patients with isolated memory impairment (mild cognitive impairment) has high predictive value for the subsequent development of Alzheimer’s disease,10 and this has been incorporated into new proposed diagnostic criteria.11 12 However, the absence of medial temporal lobe atrophy does not exclude a diagnosis of Alzheimer’s disease, and patients with young onset Alzheimer’s disease may have prominent posterior atrophy with relative sparing of medial temporal lobe structures. T2 weighted or FLAIR sequences are highly sensitive for detecting white matter abnormalities, which can reflect demyelination but, much more commonly in this age group, cerebrovascular disease. As well as detecting major strokes, these sequences allow visualisation of small strategic infarcts (such as within the thalamus and other subcortical nuclei) and small vessel ischaemic white matter damage. Although an increased white matter lesion load suggests vascular disease, particularly in combination with lesions in the basal ganglia and brain stem, the pathophysiology and cognitive consequences of MRI white matter hyperintensities remain the subject of ongoing research,13 and it is important not to over interpret minor vascular disease that commonly accompanies ageing. Significant white matter and other ischaemic changes in the presence of hippocampal atrophy support a diagnosis of mixed vascular cognitive impairment/Alzheimer’s dementia (fig 2D). Although metabolic or functional imaging is typically not performed routinely, it can provide valuable diagnostic information in certain circumstances. 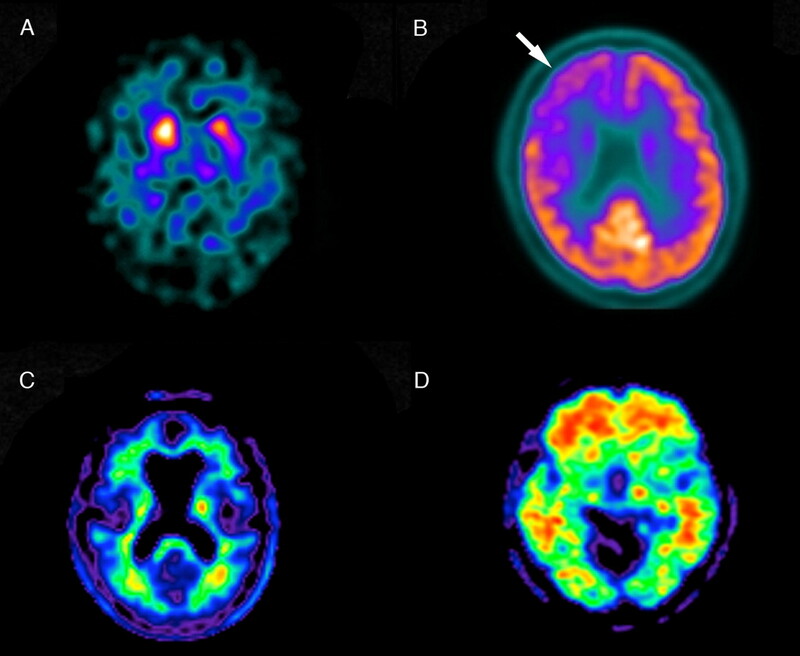 Where dementia with Lewy bodies is suspected, demonstration of central dopamine depletion using positron emission tomography (PET) (fig 4A⇓) or single photon emission computed tomography (SPECT) dopamine transporter (DAT) scanning has good diagnostic sensitivity and specificity (78% and 90% in one study17), and is now included as a suggestive feature in diagnostic criteria.18 The demonstration of temporoparietal hypometabolism using fluorodeoxyglucose (FDG) PET or SPECT scanning supports a diagnosis of Alzheimer’s disease over frontotemporal lobar degeneration (fig 4B);19 and in patients with personality or behavioural change in whom structural scanning is normal, the demonstration of focal frontal hypometabolism using FDG-PET scanning supports a diagnosis of frontotemporal lobar degeneration.20 Currently research tools, new PET tracers appear to have very high sensitivity and specificity for detecting cerebral amyloid pathology (Fig 4C, D), and are likely to find clinical utility in the near future.21 All these techniques involve the injection of radioactive tracers, with a small exposure to ionising radiation. Our patient underwent MRI, which revealed no evidence of a space occupying lesion, and very minor vascular load. There was highly asymmetric left temporal lobe atrophy with an anterior>posterior gradient (fig 2C). Neuropsychometric testing confirmed profound anomia and semantic memory impairment. A diagnosis of frontotemporal lobar degeneration, semantic dementia variant was made. Treatment with acetylcholinesterase inhibition was not indicated;2 the patient contacted the driving authorities and stopped driving; and was referred for speech and language therapy and to the Pick’s Disease Support Group. This series provides an update on the best use of different imaging methods for common or important clinical presentations. The series advisers are Fergus Gleeson, consultant radiologist, Churchill Hospital, Oxford, and Kamini Patel, consultant radiologist, Homerton University Hospital, London. To suggest a topic for this series, please email us at practice@bmj.com. Contributors: JMS conceived and drafted the manuscript, which was revised by the other authors who have all approved the final version. JDW selected the patient. JMS is the guarantor. Competing interests: All authors have completed the Unified Competing Interest form at www.icmje.org/coi_disclosure.pdf (available on request from the corresponding author) and declare: no support from any organisation for the submitted work; this work was undertaken at University College London Hospitals/University College London, which received a proportion of funding from the Department of Health’s National Institute for Health Research Biomedical Research Centres funding scheme. The Dementia Research Centre is an Alzheimer’s Research UK Coordinating Centre and has also received equipment funded by Alzheimer’s Research UK. JMS is a UK Higher Education Funding Council for England clinical senior lecturer. JDW is a Wellcome Trust senior clinical fellow. NCF is a Medical Research Council senior clinical fellow. MNR and NCF are National Institute for Health Research senior investigators. The funders did not influence the writing of this review. JMS will shortly be commencing a study with AVID Radiopharmaceuticals Inc. who manufacture florbetapir (fig 4); the authors report no other relationships or activities that have influenced the submitted work. Harvey RJ, Skelton-Robinson M, Rossor MN. The prevalence and causes of dementia in people under the age of 65 years. J Neurol Neurosurg Psychiatry2003;74:1206-9. National Institute for Health and Clinical Excellence (NICE). CG42 Dementia: NICE guideline. March 2011. http://guidance.nice.org.uk/CG42/NICEGuidance/pdf/English. Scheltens P, Fox N, Barkhof F, De Carli C. Structural magnetic resonance imaging in the practical assessment of dementia: beyond exclusion. Lancet Neurol2002;1:13-21. Knopman DS, DeKosky ST, Cummings JL, Chui H, Corey-Bloom J, Relkin N, et al. Practice parameter: diagnosis of dementia (an evidence-based review). Report of the Quality Standards Subcommittee of the American Academy of Neurology. Neurology2001;56:1143-53. Hort J, O’Brien JT, Gainotti G, Pirttila T, Popescu BO, Rektorova I, et al. EFNS guidelines for the diagnosis and management of Alzheimer’s disease. Eur J Neurol2010;17:1236-48. Duara R, Loewenstein DA, Potter E, Appel J, Greig MT, Urs R, et al. Medial temporal lobe atrophy on MRI scans and the diagnosis of Alzheimer disease. Neurology2008;71:1986-92. Burton EJ, Barber R, Mukaetova-Ladinska EB, Robson J, Perry RH, Jaros E, et al. Medial temporal lobe atrophy on MRI differentiates Alzheimer’s disease from dementia with Lewy bodies and vascular cognitive impairment: a prospective study with pathological verification of diagnosis. Brain2009;132:195-203. Likeman M, Anderson VM, Stevens JM, Waldman AD, Godbolt AK, Frost C, et al. Visual assessment of atrophy on magnetic resonance imaging in the diagnosis of pathologically confirmed young-onset dementias. Arch Neurol2005;62:1410-5. Chan D, Fox NC, Scahill RI, Crum WR, Whitwell JL, Leschziner G, et al. Patterns of temporal lobe atrophy in semantic dementia and Alzheimer’s disease. Ann Neurol2001;49:433-42. Fox NC, Schott JM. Imaging cerebral atrophy: normal ageing to Alzheimer’s disease. Lancet2004;363:392-4. Dubois B, Feldman HH, Jacova C, Dekosky ST, Barberger-Gateau P, Cummings J, et al. Research criteria for the diagnosis of Alzheimer’s disease: revising the NINCDS-ADRDA criteria. Lancet Neurol2007;6:734-46. Albert MS, Dekosky ST, Dubois B, Feldman HH, Fox NC, Dickson D, et al. The diagnosis of mild cognitive impairment due to Alzheimer’s disease: recommendations from the National Institute on Aging—Alzheimer’s Association workgroups on diagnostic guidelines for Alzheimer’s disease. Alzheimers Dement2011;7:270-9. Inzitari D, Pracucci G, Poggesi A, Carlucci G, Barkhof F, Chabriat H, et al. Changes in white matter as determinant of global functional decline in older independent outpatients: three year follow-up of LADIS (leukoaraiosis and disability) study cohort. BMJ2009;6;339:b2477. Schott JM. Limbic encephalitis: a clinician’s guide. Pract Neurol2006;6:143-53. Macfarlane RG, Wroe SJ, Collinge J, Yousry TA, Jäger HR. Neuroimaging findings in human prion disease. J Neurol Neurosurg Psychiatry2007;78:664-70. Cordonnier C, van der Flier WM. Brain microbleeds and Alzheimer’s disease: innocent observation or key player? Brain2011;134:335-44. McKeith I, O’Brien J, Walker Z, Tatsch K, Booij J, Darcourt J, et al. Sensitivity and specificity of dopamine transporter imaging with 123I-FP-CIT SPECT in dementia with Lewy bodies: a phase III, multicentre study. Lancet Neurol2007;6:305-13. Foster NL, Heidebrink JL, Clark CM, Jagust WJ, Arnold SE, Barbas NR, et al. FDG-PET improves accuracy in distinguishing frontotemporal dementia and Alzheimer’s disease. Brain2007;130:2616-35. Clark CM, Schneider JA, Bedell BJ, Beach TG, Bilker WB, Mintun MA, et al. Use of florbetapir-PET for imaging beta-amyloid pathology. JAMA2011;305:275-83.